There's more to great performance than technical ability. Emotional Intelligence research report series. 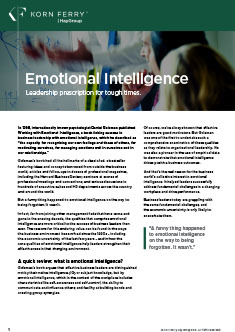 Emotional Intelligence (EI) has captured the public imagination in recent years, with estimates suggesting that at least 75% of Fortune 500 companies have adopted EI-related products and services to help them develop the soft skills of every member of their organization – from graduates to the boardroom. But what is meant by ‘Emotional Intelligence’ and what impact can it have for business? What is being measured with these tools? And how can we be sure that the results are valid? Our series of reports, which can be accessed by clicking the headers below, have been developed in partnership with Richard Boyatzis and Dan Goleman. They share recent research and explore its implications for qualified practitioners and coaches developing EI through training, coaching and education. Emotional Intelligence (EI) has been gaining ground as a business and educational intervention for the last 20 years, and the link between EI and individual performance is well documented. However, some organizational sciences scholars remain sceptical about the concept, due to a lack of clarity around the definition of EI, how it is measured, and the validity of tools. In the first report in our series, we map different definitions of EI against a model of personality, helping practitioners choose the right EI instrument for the job. 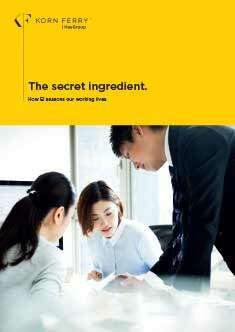 How EI seasons our working lives. As EI practitioners and coaches, we can sometimes underestimate the effect that EI can have on the people we work – employees and students – and their organizations. In the second report in our Emotional Intelligence series, we explore the impact of EI on job performance, job satisfaction, career and life satisfaction, employee engagement and career success. In the second report in our Emotional Intelligence series, we explore the impact of EI on job performance, job satisfaction, career and life satisfaction, employee engagement and career success. 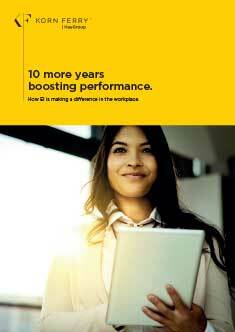 How EI is making a difference in the workplace. By the time emotional intelligence became part of our everyday language in the 1990’s, two decades of research had already established the significance of competencies for organizations. Since then, ongoing research and studies of performance have demonstrated the positive impact of specific EI competencies on measurable outcomes, like sales and customer satisfaction. This has been followed by a growing understanding of the link to employee engagement, satisfaction, leadership effectiveness and other indicators. This report summarizes recent validity studies carried out using the ESCI or its education version, the ESCI-U. Avoiding the perils of polarized leadership. The emotional intelligence of leaders contributes to their team members job satisfaction, above and beyond the employees’ own level of EI. Leaders set the tone for their teams, and influence their engagement and performance. 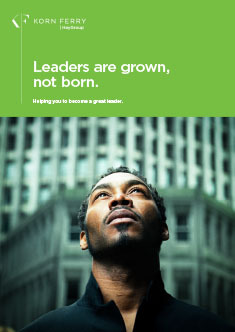 EI allows leaders to do this well. In the fourth report in our series, we review recent research findings and discuss . The penultimate report challenges traditional assumptions that role differentiation – between the task focused and the people focused leader – is natural and necessary. 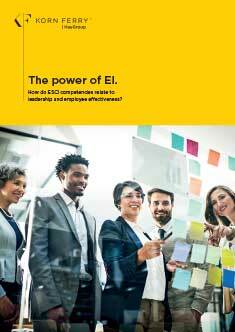 How do ESCI competencies relate to leadership and employee effectiveness? We’ve always known that the emotional and social intelligence competencies that the ESCI and ESCI-U are built on are more than just ‘nice to have’ - they underpin outstanding performance from individual contributors and leaders. Since the launch of the assessment in 1998, we have collected the normative data of nearly 80,000 participants, 2,000 organizations and 700,000 raters worldwide. 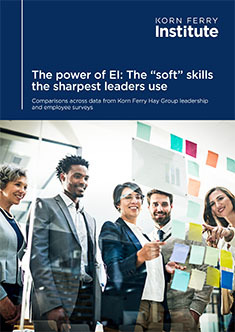 In our final report, we share our most recent findings on the relationships between the ESCI and other Korn Ferry Hay Group assessments. Organizations worldwide are increasingly recognizing the so-called "soft" skills that people in the workplace can draw upon to motivate others, push through changes and deliver superior performance in themselves and their colleagues. This new report, released by the Korn Ferry Institute, explores the growing body of evidence showing the positive impact that leaders with high EI can have in the workplace. 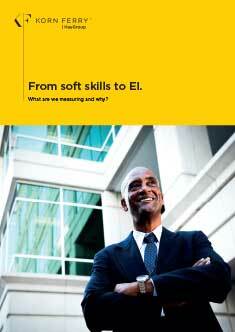 Find out more about EI. Nearly a quarter of a million people in business organizations and educational institutions around the world have received EI-related feedback. We work with Richard Boyatsiz and Dan Goleman to interpret the data, and create market leading thought leadership. A selection of our recent papers can be found below. There’s a lot more to business and leadership than brains alone. Discover the importance of EI for individuals, leaders and their organizations. Poor leadership equals poor individual and team performance. 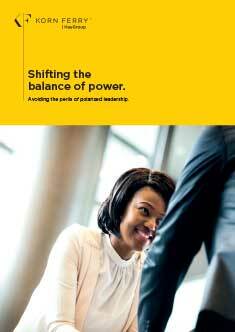 We explore the importance of climate, leadership styles and EI to develop great leaders. 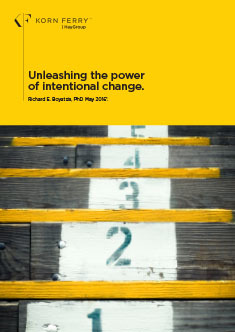 In this paper, Richard Boyatzis describes the process of intentional change and how it supports EI development. Dan Goleman’s bestselling book on EI had all the hallmarks of classic fad when it was released in 1998. But how and why did EI escape being forgotten as just another business trend? 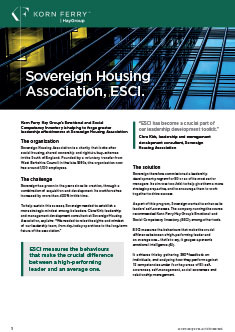 The ESCI is helping to forge greater leadership effectiveness as Sovereign Housing Association. Observing that many school leavers lacked the skills required, Oaklands college used the ESCI-U as part of their personal development. ©Korn Ferry Hay Group, 2019.